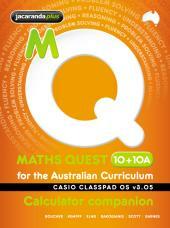 Maths Quest 10+10A for the Australian Curriculum combines online learning with a specialized mathematics assessment program. It offers guides for teachers and student workbooks to support the online learning. Maths Quest 10+10A increases the student's problem solving ability and adds to mathematical understanding, reasoning and fluency. eLessons teach students to apply math in the real world. Individual "pathways activities" allow students to choose the direction of their learning within the context of the curriculum. 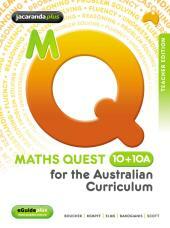 Maths Quest 10+10A uses "content strands" to increase mathematics skills. Year 10 focuses on Statistics and Probability, Number and Algebra and Measurement and Geometry content strands. assessON Maths Quest 10+10A for the Australian Curriculum has created a series of skills assessments divided by "content strand;" assessments offer instant feedback and detailed explanations to students. The assessment section also offers additional learning resources. The assessON Maths Quest 10+10A shows student progress with easy-to-use reports outline areas of student learning and areas where the student is struggling. Students can use assessON do homework assignments online and get instant feedback, the program even allows for customized practice. Ignite your potential, register for Maths Quest 10+10A for the Australian Curriculum, year 10, and get started now!